Advertorials: Florida's Natural. From Florida. Naturally. "The only major brand that's never imported." I have been a market researcher for over 20 years and during that two-decade span, I have tested "Made in the USA" at least 30 or 40 times. For most of that time, consumers resoundingly said that this claim was, at best, a support point ... clearly not a hook to hang the essence of your brand on. Often, it represented a tie-breaker. If all other things were equal, then the home town favorite would likely win. But, things have changed since 9-11. It's hard to believe, but this year marks the ten-year anniversary of the attacks on the World Trade Center. Not surprisingly, consumers became far more patriotic after that disastrous day. But, as with all other things, that patriotism seemed to wane with each passing year. The number of U.S. flags flown from homes began to dwindle. The lives of the surviving families were no longer splashed across newspapers. The memorial services held each year on September 11 became less sensationalized. But, desire for U.S. made products has slowly built since that time. 9-11 may have been the catalyst, but other factors have fueled this trend. Citizens have watched much of our manufacturing be shipped overseas. They have wrestled with the benefits that are bestowed upon illegal immigrants that flood over our borders, to the tune of about one-half million per year. They have found that most products Americans buy rarely have a "Made in the USA" tag on it. So, it's not terribly surprising that, over the years, market research has increasingly shown a growing desire for all things American. So, why did I find Florida's Natural print ad to be so surprising? 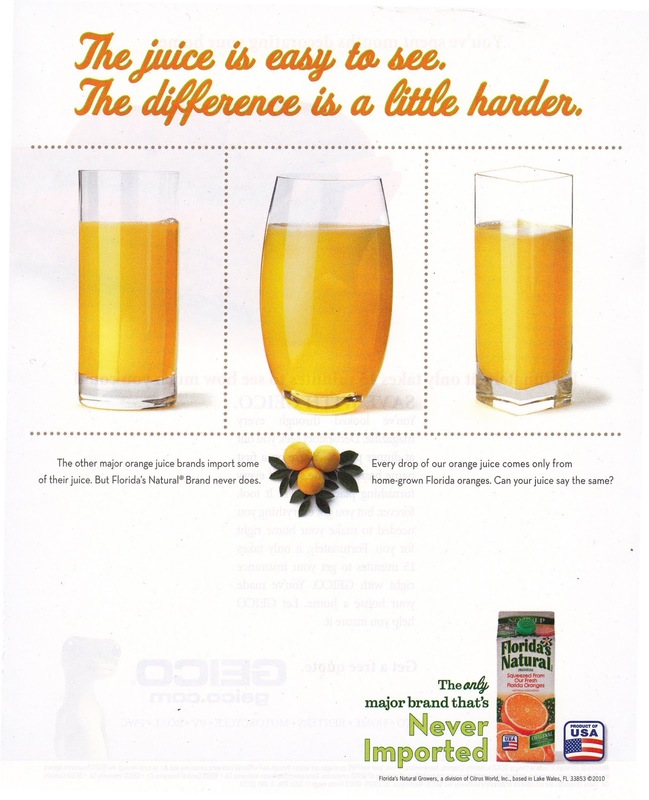 Maybe because I thought that other orange juices were sourced from sunny states in the U.S., like Florida and California (which of course is the point of this ad). But, I think my reaction was more visceral than that. I've always associated oranges with Florida. Like every other college kid that spent their spring break in Daytona Beach or Fort Lauderdale or St. Petersburg, I brought a bag of fresh oranges home with me. An orange is iconic of Florida. So, I ask myself, why would all the competitors leave Florida to buy their oranges? Of course, one doesn't need to think too hard to come up with the answer ... money. Buy oranges cheaper in countries where labor is less expensive and then sell them in the U.S. with the illusion that they were grown here. Bully for you Florida's Natural. Thanks for staying true to your brand and your consumers.